They're still in use by musicians today, but those full-size electronic drum pads seemed to have hit their peak with consumers sometime in the mid-80s, alongside Casio's ubiquitous electronic keyboards. But if you're feeling nostalgic, and handy with a soldering iron, this miniature DIY modern alternative won't end up collecting dust in the corner of your basement when you get bored of it—maybe a drawer instead. 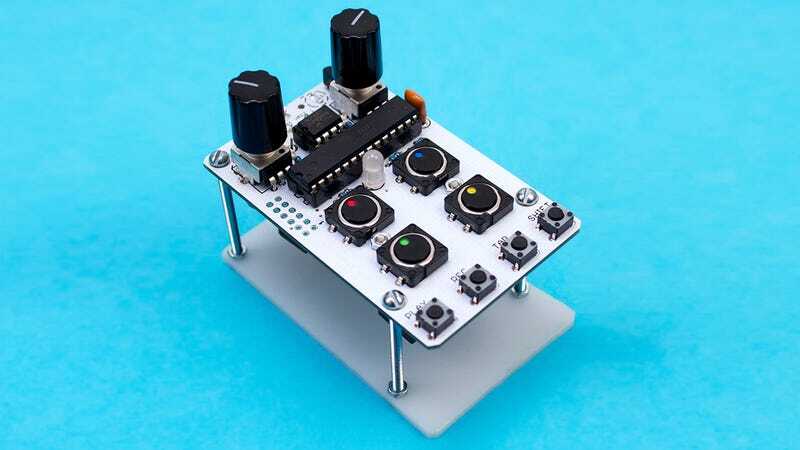 When assembled the Bleep Drum includes four distinct samples with pitch controls for tweaking the sound even further, the ability to tap out and record a sequence, and the requisite stereo hookups you'll need to patch this into your stereo. With a little hacking you can even upload your own custom sounds, and if you're not comfortable with your DIY skills the $60 kit also comes in a pre-assembled version for $85. But if you can find yourself a Dummies Guide to Electronics for less than $25, you're already saving yourself a few bucks.